VANCOUVER - Every once in a while, Delvin Breaux walks out of a store only to be stopped when the anti-theft detection system goes off. The Hamilton Tiger-Cat defensive back always has the required receipt. But he also walks around with a tangle of metal screws, rods and plates after breaking his neck in 2006 playing high school football in Louisiana. 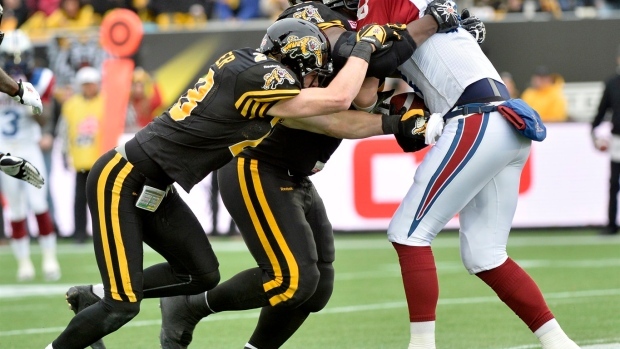 Breaux is more than the Ticats' shutdown corner. He is a study in courage and perseverance. "Great player. Better man," said Hamilton special teams and linebackers coach Jeff Reinebold. A highly recruited 17-year-old, Breaux was headed for NCAA glory when his life slid off the rails in a game between his McDonogh 35 High School and Jesuit High in New Orleans. Racing down the left sideline on special teams, Breaux angled towards the kick returner and, cutting round the corner of the five-man wall, launched himself at the ball-carrier like an Exocet missile. Later at the hospital, he was told he had broken his C4, C5, C6 vertebrae and an artery had been partially blocked by a chopped bone. His doctor told him he should be dead. Eight years later, the 25-year-old Breaux is a CFL Eastern all-star in his second year in the league. On Sunday, he has a second shot at the Grey Cup, with only the Calgary Stampeders in his way. "I'm thankful just for the opportunity to be here," he said Thursday. "And to be alive." Breaux knows his story is inspiring, and he's willing to share it. But his preference is not to dwell on the past. "I don't like to be reminded of what happened, because I could have been dead," he said. His journey back was long and hard. The injury cost him his football career at LSU, one of a plethora of top schools to offer him a scholarship, and sent him to some dark places. "The moments when I didn't have anywhere to go. The moments when I could see myself not being the person I wanted to be," he recalled. Breaux credits his faith and fiancee Kasey for helping him get back on track. He gradually built back his body and signed on with the semi-pro Louisiana Bayou Vipers in 2012 just to get some game film (shot by Kasey) to show scouts. In reality, there was almost nothing pro about the Gridiron Developmental Football League. It was disorganized and Breaux played for free. But he saw it as a chance to resume pursuing his dream. "It's not about money, it's not about chasing girls," said Breaux. "It's about having passion for the game or having passion for what you like to do. To play the game for free after breaking your neck, man I think that's inspiring." Breaux worked out in front of pro scouts in San Antonio, turning heads by running 40 yards in 4.35 seconds and covering receivers like a glove. CFL scouts were interested but the level of competition in his prized semi-pro game film did not wow them. Someone suggested he tried Arena Football and, after a brief stint with the New Orleans VooDoo, he signed in Hamilton as a free agent in May 2013. Today the six-foot-one 196-pounder is a key member of the Ticat defence, usually tasked with shutting down star receivers. In the Eastern final, he kept Als wideout Duron Carter under wraps for close to three quarters. Carter, who hauled in 75 passes for 1,030 yards during the regular season, finished with three catches for 25 yards. The Breaux show is winning rave reviews. "I'm just super proud of Delvin," said Hamilton defensive co-ordinator Orlondo Steinauer. "He's in just his second year and to me he had the same type of year last year. He just had some injuries and wasn't getting any recognition. "He's a guy who's not going to have a lot of stats. He's just going to have tight coverage a majority of the time." "He's definitely a stud," added Hamilton quarterback Zach Collaros. "I know our guys do not like playing against him in practice. He's a very physical corner. He covers well, he runs well." Breaux acknowledges he has a lot to be thankful for these days. He is living his dream. And when someone recognizes him in Hamilton, he sees it as proof he is a role model and doing something positive with his life. Not surprisingly, Breaux keeps what happens on the field in perspective. He says losing the championship game to Saskatchewan last year was difficult. But he dealt with the disappointment. "On the plane ride home I was thinking about it," he said. "But at a point in time you just have to get over it. The game is over with and you just have to work on next season." Breaux says his neck is 100 per cent these days, although he works hard at maintaining the strength in that area. He is reminded of what happened daily, however, via the scars on the front and back of his neck. Still the day his life almost faded to black is behind him. "There's nothing but light in front of me."